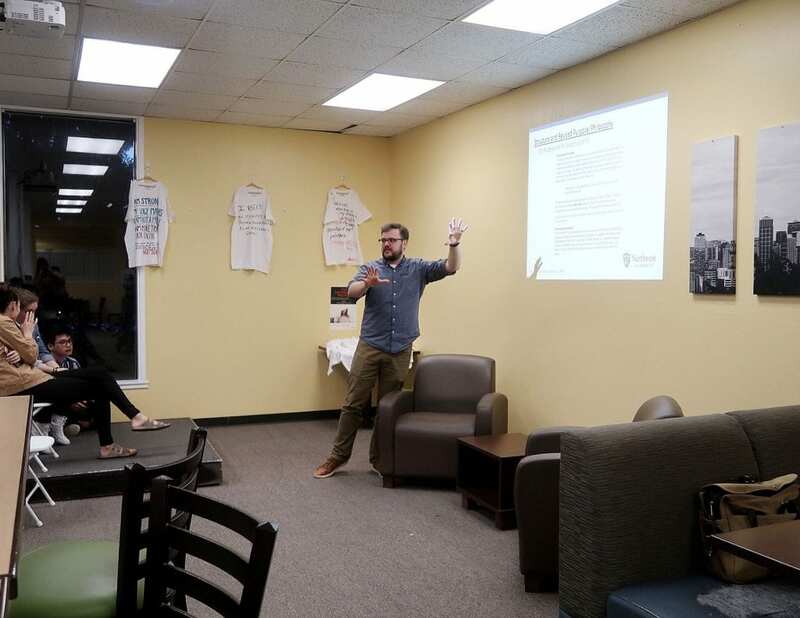 ASNU held a town hall on Tuesday, March 19, to discuss revisions to the NU Student Handbook, specifically proposed changes to the Accountability Process. The town hall was facilitated by Rick Engstrom, Dean of Student Development, Peter Carlson, Area Coordinator for Gray-Beatty residence halls, and Sarah Jobson, Director of Resident Life and Housing. This meeting was the final event in the process of revising the Student Handbook. The goal of these revisions is to clarify the pre-existing guidelines, as well as to clearly define the student accountability process. “There is a structure issue here,” Engstrom said. The meeting was designed to get feedback from students regarding these new changes. “We are not going toward victimhood, but striving to be godly and holy persons,” Carlson said. One of the major adjustments was to the criteria for appeals in the accountability process. The new criteria is 3-fold. Appeals can now be made if: 1) there is new information presented after the first hearing; 2) if due process is not followed; and 3) if the processing of trial was inconsistent with the Student Handbook. “We are setting people up to have more successful appeals,” Engstrom said. In the revised trial process, students are now allowed to have greater choice in their support person. Previously, students were only allowed to have a support person who was faculty or staff. This support person has their own set of guidelines and responsibilities stated in the proposed changes to the Student Handbook, including but not limited to confidentiality, communication restrictions and disruption consequences. Another main highlight of the revisions being made is the addition of bullet points to the pages. Previously, the format of the handbook was written in a longer narrative, which has been shown to inhibit the desire of students to read the handbook. The meeting was completed with a question and answer session. One of the questions was regarding the accountability process for student-athletes. Engstrom spoke against campus rumors of favoritism toward athletes. He said that each student is held accountable in the same ways by Student Development. He also added that they allow the coaches to have a say in the disciplinary process, and that coaches are welcome to add any penalties that they see fit. Engstrom also said that they can only attest to what problems have been brought to them, and if some students discuss with their peers about supposedly escaping consequences, then Student Development was not involved in that process. In addition to student-athletes, scholarship holders have the same accountability procedures. The scholarship-awarding entity has a say in the disciplinary process as well. Rules and regulations for scholarship holders are outlined in the scholarship paperwork. According to the handbook, Northwest University is striving as a whole to follow a Biblical accountability process. The changes are designed to promote community in accountability, and to give each student fair and due process. The updated handbook will be put into effect by fall 2019. A link to the Student Handbook revisions can be found here.